Scientists have found a parasite from Asian salmon in North American fish, according to a newly released study on samples taken from Southcentral Alaska conducted with help from state officials. 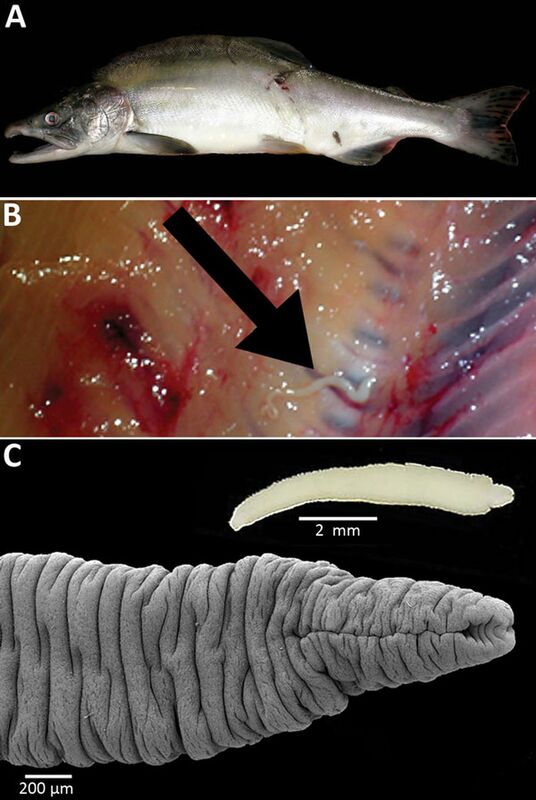 The study, appearing in February's issue of the journal Emerging Infectious Diseases published by the U.S. Centers for Disease Control and Prevention, reports on the discovery of Japanese broad tapeworm in Alaska salmon. Its authors say the results could mean Japanese broad tapeworms infecting humans have been mistaken for fish tapeworm, a species known by the CDC to affect North American fish. Kim Stryker, who manages the state Department of Environmental Conservation's Food Safety and Sanitation Program, said that Japanese broad tapeworm being found in Alaska salmon didn't present any immediate food-safety concerns beyond those for eating uncooked fish in general. "It would really only be a concern if the product was eaten raw, and that includes ceviche," Stryker said. "People think that's cooked, but it's not cooked enough to kill parasites." Study co-author Jayde Ferguson, a fish pathologist with the state Department of Fish and Game, said Thursday he got involved in the study when scientists from the Czech Republic visited Alaska to conduct studies on marine parasites. "These guys literally wrote the book on tapeworms," Ferguson said. "I kind of helped them out with the logistics — where to go, lab space, stuff like that." Scientists have found Japanese broad tapeworm, which was first identified in 1986 and can affect humans who consume infected fish raw, in chum, masu, pink and sockeye salmon from Japan and eastern Russia. About 2,000 cases of humans infected by the tapeworm have been reported primarily in northeast Asia, although the study says infections are likely under-reported. The authors of the study, conducted with support from the Czech Science Foundation, examined 64 Alaska-caught wild salmon in July 2013, including 31 sockeyes, 23 pinks, eight rainbow trout and one each of king and coho salmon. Several tapeworms were found, including one larva taken from a pink salmon caught in Resurrection Creek near Hope that was a 99 percent match for Japanese broad tapeworm based on a genetic database. "This report provides additional evidence that salmon from the Pacific coast of North America may represent a source of human infection," the scientists wrote. "Because Pacific salmon are frequently exported unfrozen, on ice, (Japanese broad tapeworm larvae) may survive transport and cause human infections in areas where they are not endemic, such as China, Europe, New Zealand, and (the) middle and eastern United States." The Alaska Seafood Marketing Institute says Alaska accounts for about 90 percent of Pacific salmon commercially harvested in the U.S., but only about 6 percent of those fish are shipped fresh; the majority is either frozen or canned before leaving the state. When it comes to consumers, commercial sushi and ceviche — what you'd order in a restaurant or grocery store — shouldn't be a problem. The Alaska Food Code requires businesses to freeze fish before serving in order to control the parasite hazard, Stryker said. It's recommended that people who want to eat raw or undercooked fish that they've caught themselves (or bought fresh) should freeze their fish first for the same reason. Ferguson said Alaska fish already carry several species of tapeworm — creatures with a "complex life cycle," beginning when tapeworm-infected birds and mammals excrete tapeworm eggs into water. Those eggs produce larvae, which are then eaten by and infect small crustaceans known as copepods; fish are infected when they eat those copepods, and mammals acquire tapeworms by eating infected fish. The Alaska discovery of Japanese broad tapeworm is a result of technology being better able to distinguish individual species of tapeworm, Ferguson said, rather than any aggressive spread of the Japanese variety. He pointed to existing evidence of the Japanese tapeworm being discovered in North American wolves and bears since 2008. "There's just more and more evidence of this worm infecting people outside of Asia," Ferguson said. "This worm has always been here, and we're just getting better at identifying it." Ferguson echoed DEC's view regarding the study Thursday, saying there's no significant difference between Japanese broad tapeworm and fish tapeworm. He also noted that nothing in the study merited a public warning about Alaska salmon during its gradual peer review process. "If it was anything that was of concern, increased risk or anything like that from a management standpoint, we would have said something," Ferguson said. "They're wild animals — they're going to have parasites, they're out in nature." Fish and Game has posted an online booklet about fish diseases, which recommends cooking fish to at least 140 degrees Fahrenheit for at least five minutes or freezing it to 4 degrees below zero for at least 60 hours to kill any parasitic worms. Tapeworms are covered on pages 60 and 61. * Editor's note: This article has been amended to clarify the state requirement for commercial businesses to freeze fish before serving.